The Range Tent has many names. 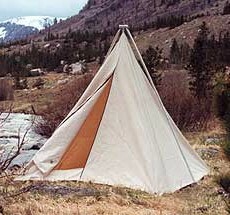 They have been called Spike Tents, Herder Tents, or Pyramid Tents. Whatever name you use, this style tent remains one of the most versatile and easy to use tents that there is. The Reliable Range Tent can be set up simply with an outside two pole system, a single interior pole, or by simply suspending the peak from a tree branch. We offer them in our 12 oz, 10.10oz Marine, or 10.10oz Flame Retardant canvas. Utilizing a flame resistant vinyl laminated nylon material for the floor. The poles are sold separately. Click here to go to the pole page.